Thank you for your interest in having your child's birthday party here at our beautiful state of the art Equestrian Center. Birthday Parties usually run about 2 hours, however, we can customize the time frame to meet your specific needs. We host Birthday Parties on Saturday and Sunday afternoons, as well as on school and national holidays. 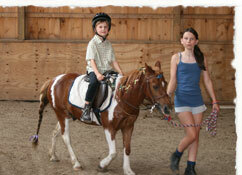 We have hosted birthday parties for children from the ages of 2 thru 14. Use of our designated party area: inside or outside space available! * A $50 non-refundable deposit is required to reserve your day/time. All rides are inside our state of the art facility, so we have you and your guests covered in RAIN OR SHINE!